Often unheralded, but used every day, Walt Disney World has top of the industry support and services for accommodating guests with disabilities. So it’s nice when they get recognized for it. The most recent award has come from across the pond. The Gold Autism Award was presented to Disney on behalf of The United Kingdom Autism Foundation for Disney’s efforts supporting and accommodating autistic guests. One of the many fun jobs Walt Disney World’s ambassadors enjoy is to take Mickey Mouse out to reward achievers in the community. This last week, Mickey Mouse visited local schools this week to recognize 18 students in the five-county area as Disney Dreamers & Doers Shining Stars. Disney Dreamers & Doers recognizes students throughout Central Florida who serve as role models at school, at home and in their community. 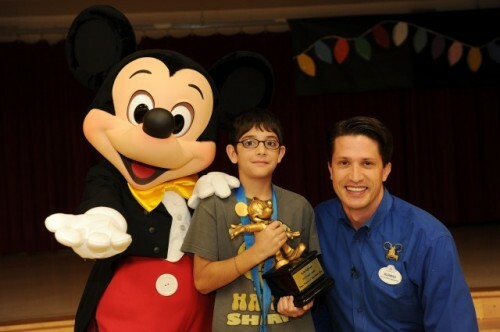 Approximately 400 students were chosen as their school’s 2012 Disney Dreamer & Doer. In addition to a visit from Mickey Mouse and the prize patrol, Disney Dreamers & Doers ShiningStars receive a Mickey Mouse statue known as a “Mousecar”, Walt Disney World annual theme park passes for themselves and their immediate family, a gold medallion and a special invitation to attend the upcoming Kids and Nature Celebration at Walt Disney World Resort. From the Dreamers & Doers, a panel of judges selected 18 Shining Stars from elementary, middle and high schools in Orange, Osceola, Seminole, Lake and Polk counties, as well as the Florida Virtual School. These students are considered the best of the best. They consistently demonstrate outstanding character, lead by example and have a caring spirit. Well, the name change may not yet be official, but that hasn’t stopped the Disneyana Fan Club, aka NFFC, from moving forward. A new award honoring individuals outside the Walt Disney Company who have made significant contributions to promoting awareness of, as well as the preservation of, Disney history, will be awarded from the first time in January. 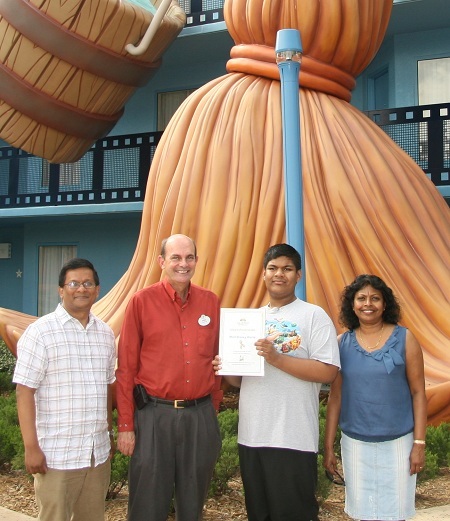 The first recipient of the NFFC—Disneyana Fan Club Heritage Award is Leonard Maltin. In addition to his internationally best selling series of books, Leonard Maltin’s Movie Guide, Mr. Maltin’s other works include, Of Mice and Magic: A History of American Animated Cartoons and The Disney Films. Additionally, he wrote the television special, Fantasia: The Creation of a Disney Classic. Mr. Maltin is also active in the home entertainment field hosting and producing, among other titles, the popular series of Walt Disney Treasures DVDs. More about the luncheon and Maltin’s contributions below the jump. But don’t forget the December 10-13 Holiday Show and Sale in Orlando in the meantime. Learn more at NFFC.org.